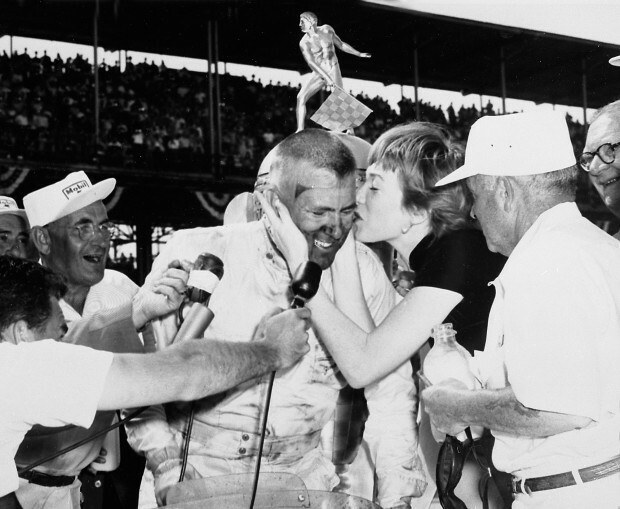 Jimmy Bryan of Phoenix celebrates his 1958 win at the Indy 500. He died in 1960 after a crash at a Pennsylvania track. In celebration of Arizona's centennial, the Star will feature our picks for the 100 best athletes, moments and teams. Throughout the summer, we will showcase our list - with the first 90 in no particular order. In August, Greg Hansen will choose his top 10, with a column on each. When he narrowly missed a first-lap crash that involved 15 cars and killed one driver in the 1958 Indianapolis 500, Phoenix racer Jimmy Bryan looked down at his steering wheel. He saw a third hand on it. "He wasn't much of a religious man but felt that was a spiritual moment," Phil Sampaio, who co-authored a book about Bryan, told the Arizona Republic. Bryan went on to win the race, continuing a strong stretch for Arizona-based drivers in the middle of the 20th century. Tucson drivers Roger McCluskey and Bill Cheesbourg also had success in the event while Pennsylvania native Bill Holland had a remarkable run before eventually moving to Tucson in the early 1970s. Holland won the 1949 race and, in his four other starts, finished second in 1947, second in 1948, second in 1950 and 15th in 1953. Known also for his Blue Crown Spark Plug cars, raced from 1947 to 1950, Holland was named one of the Indy 500's greatest 33 drivers of all time. McCluskey enjoyed a 32-year racing career and started 17 Indy 500s, finishing third in 1973, fifth in 1975 and in the top 10 two other years. He went on to become executive vice president and chief operating officer of the United States Auto Club, which runs the Indianapolis 500. Cheesbourg, whose career began at age 11 in a soap box derby on "A" Mountain, entered seven Indy 500 races between 1957 and 1965, with his highest finish of 10th coming in 1958. Cheesbourg was the last living link to Arizona's successful midcentury drivers, passing away in 1995. And, while Bryan survived the 1958 Indy 500, he died two years later after an accident at Langhorne Speedway in Pennsylvania. 2-2-1-2 Bill Holland's first four finishes, still an Indy 500 record for a driver's first four races.